I recently had Pinot’s Palette reach out to me about the grand opening celebration of their new location at Town Square (They also have one in Green Valley and Boca Park). 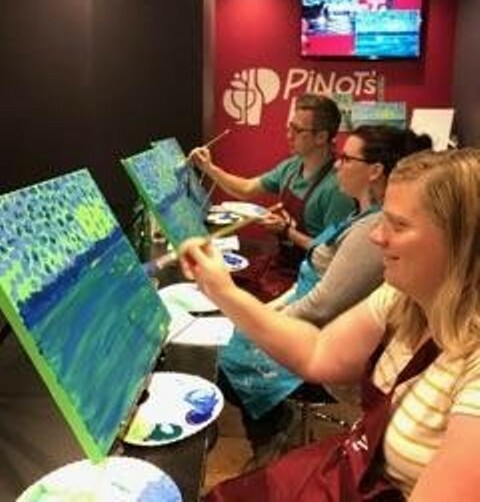 As part of the invitation, I was offered a number of free classes so I could experience Pinot’s Palette first hand. My first reaction to this was “I don’t drink.” They noted that I could still paint even if I didn’t drink and that many who attended didn’t go to drink. Little did they know that I don’t paint. I love doing most things in life, but art has never been one of them. Once I got over my own selfish desires, I had an even better idea. I should see if the Crash Wife wanted to go and do some art. She’s a fantastic artist and has an incredibly creative mind. Didn’t take long after I asked for her to reply that she’d love to go. The amazing part of this to me is that I loved that she went as much as she loved it. There’s just something special and beautiful about seeing your wife get out of the house, away from the kids, with a friend doing something she enjoys. I really loved it and I can’t wait for her to go and do it again. As part of Pinot’s Palette’s Grand Opening celebration on Friday, April 7 and Saturday, April 8, participants can sign up for either of the two-hour 7 p.m. classes on Friday or Saturday for $39, with 100 percent of the painting proceeds to be donated to St. Jude. Guests interested in signing up for Friday’s class can register online and Saturday’s class registration is available. I think we’re going to have more of the Crash Wife’s paintings around the house and that’s really exciting to think about.